Home Linux KVM Use virt-manager to share files between Linux host and Windows guest? I usually set-up a Samba server on the Linux KVM host and then share a folder out using that to my KVM guests. The documentation on sharing a KVM host’s directory with the KVM guests (Linux) is available here on the virt-manager website. 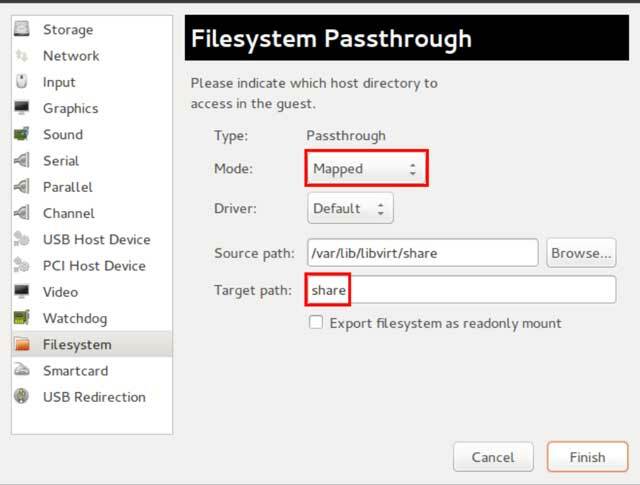 The page is this: Example Sharing Host files with the Guest. The Linux-KVM website also contains directions for setting up Samba. Your home network might have a few Windows machines on the ground floor, a Mac in an upstairs bedroom, a PocketPC on a nightstand, and a Linux box or two in the basement, all networked with a generic router. For all the devices in this family setup, or even a scenario with thousands of users, the Samba suite is an ideal solution for file and print sharing. Several cross-platform file and print-sharing solutions exist, but Samba and the SMB/CIFS protocol may be the easiest to implement in a home networking environment. Windows machines and Macs come with the functionality to work with Samba out of the box, and you should only need to install a single Samba package for Linux machines. GNOME and KDE offer Samba client functionality built into their default file managers, Nautilus and Konqueror, respectively. Note: That you will to be root to edit these, or use sudo. Samba will run on nearly any Unix-like system and can be found in the repositories of just about every Linux distribution. Begin by using your distribution’s package manager to make sure it installed. Samba is a very mature and sophisticated package, so its configuration file can be long and complicated. You will have to trust that your distribution supplied you with a reasonably sound default configuration and focused on changing just a few lines in smb.conf to make sure they are appropriate for a home network. If you want to know more about any line, consult man smb.conf. Remember that any line in the configuration file preceded by a semicolon (;) or hash mark (#) is a comment and maybe not be recognized as an active setting. To activate the line, remove the semicolon or hash. It’s a good idea to add your comments preceded by one of these characters so that you will remember the logic behind your configuration the next time you load smb.conf. For a home network, you may want to consider setting this to share. The main difference is that with the user setting you will be required to log into the Samba server before you can browse its resources. This is a wise precaution on untrusted networks but will be inconvenient when using resources you would like your entire household to have access to, such as a printer. With share enabled, you can still require users to authenticate themselves with a password to access particular resources. Note that the final digit of the IP address was left off on the hosts allow line. This setting specifies that any IP address in that range is allowed. For additional security against external access, look into blocking Samba ports with a firewall. It’s time to move beyond [global] and configure specific shared resources. Begin with the [homes] section. By default, your distribution may have this section configured to allow users to access their home directory on the machine running the Samba server. If you have security = share set, this feature may not work as expected and users may be presented with home directories without logging in. If you are the only one with a home directory on the machine running the Samba server anyway, which is likely in a home network environment, it is advisable to remove or comment out (using hash marks or semicolons) the [homes] section and add any useful directories as shared resources individually later on. Share Name is whatever title you choose (to the client accessing your server, this will appear to be the name of the shared directory). The guest ok = yes line is what specifies this share as publicly accessible. The browseable = yes line will make the share appear available to all users. Set browseable = no to force users to manually type in the share name to access it. Of course, you can set read only = yes to restrict users from making changes to the directory remotely. Here, the user is the user name on the machine running the Samba server of the person with access privileges to the share. Use these two templates to add shares for all the files users may want to access from the server machine. Is easy to make shared directories more accessible. In Windows XP, right click on the share in Explorer and choose “Map Network Drive…” You will be able to assign them a drive letter, such as Z:, so that they may be easily found in My Computer, even after a reboot. In my testing on Windows XP with the security level set to share, printers are automatically be detected and available to use from the Windows machine. With user-level security set, it was necessary to log into the server in a Windows Explorer window before trying to print. Your experience with other versions of Windows may vary. Samba and Windows shares can be easily accessed from the default file managers of both Gnome and KDE. We’ll begin with accessing shares from Nautilus in Gnome. Open Nautilus and go to File -> Connect to Server. Choose “Windows share” from the listbox and enter the server name or IP address of your Samba server. You can also click the “Browse Network” button and look in the “Windows Network” directory to search for the server manually. Click “Connect” and a Nautilus window will open with the browseable resources of your Samba server. Note that user and share are optional criteria. Configuring printers over Samba is similarly easy in both these desktop environments. In Gnome, go to System -> Administration -> Printing. In the printer configuration application, select Printer -> Add Printer. You will be prompted for your password. In the add printer wizard, select “Network Printer” and then “Windows Printer SMB” from the listbox. You will be prompted for a user name and password on your Samba server. Identify your Host and Printer on the Samba server and then move on to the next screen. Select your printer model and then click Apply. To do the same in KDE, open the configuration center by launching the command kcontrol. Navigate to the Printers module and go to Add -> Add Printer/Class… In the resulting dialog, click Next and then select “SMB shared printer (Windows).” Click Next again and configure the username and password of a “Normal account,” if using user-level security. Click Next another time and then Scan to browse for your Samba server. Alternatively, enter the server details manually. On the next screen, select your printer model from the list. Click through the next few screens and give your networked printer a title to finish up. Again, the exact path of your smb.conf may vary by distribution. We have only explored basic Samba functionality here, tailored for a home network. More extreme usage scenarios are addressed in detail in the Samba by example guide.